Below is an article featuring the selected student flight team from the SSEP Mission 6 community in Madison Heights, Michigan. SSEP in Madison Heights is lead by two dynamic educators, Randy Speck, Superintendent of the Madison District Public Schools, and Angel Abdulahad, Lead Enrichment Teacher at Wilkinson Middle School. Over the course of Mission 6, Randy, Angel, and their SSEP Local Team of educators formally engaged 275 students in microgravity experiment design, and received 27 proposals for flight experiments from their student teams. On May 20-21, 2014, the SSEP National Step 2 Review Board met at the Smithsonian National Air and Space Museum, and selected the proposed experiment Coliform Bacteria from future Doctors Alfadhli, Alsabagh, Kafra, and Sabah as Madison Heights’ flight experiment, one of the three finalist proposals submitted by the community for review in Washington along with finalist proposals for the other 17 communities. The article below first appeared in August 2014, in The Chaldean News. We wanted to highlight the story at this SSEP National Blog because it shows that SSEP is more than a STEM education program, it changes lives, and it changes communities. It’s what you would expect when education is successfully woven into the tapestry of life in a community. We wanted to reprint the article as a Mission 6 highlight after the launch of the Yankee Clipper Mission 6 experiments on Orb-3, on October 28, 2014. But the destruction of Orb-3 and the loss of Yankee Clipper forced a new focus – gearing up for a stunningly rapid re-flight of reconstituted Mission 6 experiments as Yankee Clipper II on SpaceX-5, now launching on December 19, 2014. In my December 8, 2014, blog post The Loss of Orb-3 and SSEP Yankee Clipper: Failure Happens. What we do in the face of failure is what defines us, I tried to capture the very emotional experience for the SSEP Mission 6 teams across the nation in the immediate wake of the accident on October 28. The impact on all the Mission 6 flight teams from the loss of their experiments was now national news, and NBC News was there in Madison Heights. You are invited to read the article below which captures the excitement in Madison Heights before the loss of Orb-3. Then read the NBC story Hard Lesson: Rocket Blast Teaches Teens Cost of discovery to get an understanding of this team’s story after the launch failure, as well as teams in San Marino, CA, and Kalamazoo, MI. It’s important to note that the story in Madison Heights played out in each of the Mission 6 communities, where a team of dedicated educators took hundreds of students on a journey to the frontier, a place where lessons in life abound. Imagine coming up with a science experiment creative enough to be conducted on the International Space Station (ISS). Now, picture doing that as a refugee new to the United States and just learning to speak English. That’s the feat four seventh-graders pulled off at Wilkinson Middle School in the Madison District Public Schools. Israa Alfadhli, Regina Alsabagh, Maryam Kafra and Farah Sabah – Team International Girls – are the young scientists behind the scenes. The girls were one of many teams at the school to participate in the Student Spaceflight Experiments Program (SSEP), an education initiative by the National Center for Earth and Space Science Education. The program required student teams to design an experiment that accesses the impact of microgravity (weightlessness) on a physical, chemical or biological system on the ISS. When a rocket launches from the Mid-Atlantic Regional Spaceport in Virginia on October 21, its payload will include 18 student experiments, including the one from Team International Girls. An astronaut aboard ISS will conduct their experiment, and it will be returned to Earth for harvesting and analysis by the team. 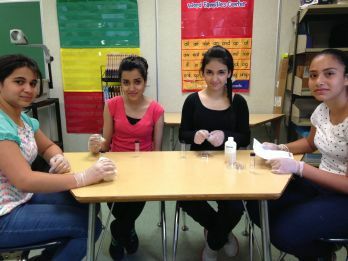 The Madison girls’ experiment will study the effects of microgravity on E. coli bacteria. Since having enough drinkable water on the Space Station is a major challenge, the experiment is very relevant to the space program, said Angel Abdulahad, the school’s lead enrichment teacher who ran the project. It was one of 12 the school forwarded for review in a formal two-step process. That review team selected the top three proposals with suggestions on how to improve them. After tweaking, the three were sent for level two clearance, which took place at the Smithsonian in Washington, DC. After additional fine tuning, they were cleared to be formally submitted to NASA for a flight safety review. Each junior scientist has a compelling story. Israa Alfadhi, 12, had no formal schooling in her native Baghdad. The family lived in Turkey for two years after leaving Iraq, and then spent two months in Arizona before finally settling in Michigan. She hopes to one day become a doctor. Regina Alsabagh, 14, only attended school for two years in Iraq and was taught to read and write by her parents. She lived in Turkey for one and a half years, where she had no schooling, before coming to Michigan last August. She wants a career as a police detective. Maryam Kafra, who is nearly 13, left Iraq during the first grade after her family’s house in Kirkuk was bombed. The family spent two years in Lebanon before coming to the United States in July 2013. Farah Sabah, 14, spearheaded the project. After her school in Baghdad was blown up, she didn’t attend for two years. Then the family went to Turkey as refugees, where they stayed for four years with no schooling. Farah just started at Wilkinson in March and was named the school’s Student of the Month in June. She also hopes to become a doctor. Other Chaldean students also had success in the space project. The third place winners, Team Wildcats, included Angelo Tomika, Brandon Istifou and Rancy Hanna, while the second-place team, Megaminds, included Maisam Raouf. Chaldean Angel Abdulahad, lead enrichment teacher at Wilkinson Middle School, knows all about the challenges of being a newcomer. He was in the same positon himself in 1986, when he entered school for the first time as a fifth grader in Oak Park. Abdulahad’s family fled his native Iraq in 1982 during the Iran-Iraq War and spent five years in Spain waiting for permission to enter the United States. Abdulahad has been teaching for 13 years. He joined the Madison district after working as an ESL instructor, mainly with Hispanic students, in Pontiac. His Chaldean and Arabic were a bit rusty when he first came to Madison, he admits. “I wasn’t even looking for a new job,” he said, but when he learned about Madison’s dedication to serving its refugee population, he was sold. Abdulahad speaks highly of Madison’s superintendent of schools, Randy Speck, who is dedicated to educating the 300 refugees in his district. “He truly loves these kids, not just because it’s his job,” Abdulahad said of his boss.